The man told police he said a "little prayer" for the toddler when he killed her. LETHBRIDGE, Alta. — A man accused of murdering a child and her father told police during a re-enactment of how he killed the girl that he had said a "little prayer" for her. Jurors at Derek Saretzky's trial were shown a police video Friday that showed Saretzky, his hands handcuffed in front of him, taking investigators to the spot where he told them he choked Hailey with a shoelace before dismembering her and throwing her body in a campground firepit. Saretzky, 24, is charged with first-degree murder in the September 2015 deaths of two-year-old Hailey Dunbar-Blanchette and her father Terry Blanchette, who was 27, in the southern Alberta town of Blairmore. Terry Blanchette's bloodied body was found in his home in Blairmore, Alta. He is also accused of killing 69-year-old Hanne Meketech, who was found dead five days earlier in her mobile home in nearby Coleman, Alta. The video shows Saretzky sitting in the back of a police cruiser next to an officer and giving directions on how to get to the remote campground. It is partially owned by a member of his family, but he said he had never been there before. A number of police vehicles were already there. An individual had called police after spotting what he believed were human bones in the firepit. "I choked her there,'' Saretzky said on the video, pointing to a spot near the firepit. 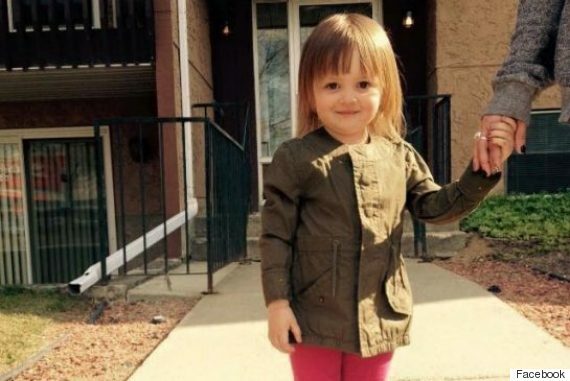 Two-year-old Hailey Dunbar-Blanchette's remains were found in a campground firepit. Saretzky said he poured the blood into a plastic bottle, which he threw into the fire along with his clothes and Hailey's body. A discarded yellow child's toy can be seen on the video a couple of metres from the firepit. DNA evidence identified blood on it that was matched to Hailey. Saretzky repeated that he ate a portion of Hailey's heart. Derek Saretzky was suspected in the disappearance of Hailey Dunbar-Blanchette when an Amber Alert was issued for her in September 2015. Staff Sgt. Mike McCauley asked Saretzky if he had said a prayer for the little girl. There was a brief adjournment in court when one of the jurors started sobbing and needed a break. Saretzky has pleaded not guilty to the murders, although court has already heard that he confessed to police. Before the noon break, Crown prosecutor Photini Papadatou asked McCauley if he had worked on the Meketech case as well. He said he hadn't initially, but there were a number of similarities between the deaths of Blanchette and Meketech, which led him to believe that Saretzky might be a suspect in both cases. Six months after Saretzky confessed to killing Blanchette and his daughter, McCauley interviewed him again at the Calgary Remand Centre. In a video played for the jury, Saretzky told him he had also killed Meketech, who was a friend of his grandparents. He called it a "spur of the moment" decision. "I didn't really think about it, I just went ahead and did it," Saretzky said. "I didn't think anybody cared about her." Saretzky said he now regrets killing his grandparents' friend. "I just got motivated and went and did it. Didn't think about how it would affect anybody else or myself or my family." McCauley asked if Meketech was practice for the killings of Blanchette and his daughter. "Yeah I guess so," he replied.